mwe3: Can you tell us where youre from originally, where you live now and what do you like best about it? Ville Leppänen: Im from the capital area of Finland, Espoo to be exact. I nowadays live near Helsinki in Vantaa city. Its a sleepy suburban area, nothing special in it. Peaceful place, its also easy to get on tour thanks to the near highways, railway and airport. mwe3: What period of music did you grow up in and who were your biggest musical influences, both from a musical / compositional point of view as well as from a guitar perspective? but yeah, then Elvis died and that launched a big American 1950s revival in Finland. I heard Buddy Holly, Gene Vincent, Eddie Cochran and other great rockers of that decade. I suddenly realized I was playing a holy instrument, the guitar! That took me on a path which led to blues, country, western swing, jazz, cajun... slide guitar became my favorite playing style. Jimi Hendrix was great but Johnny Winter, Rory Gallagher and Ry Cooder were my heroes because of their slide playing. And then, at the same time I dug those cool jazz players like Charlie Christian, Barney Kessel and Wes Montgomery. Jazz influences came into my playing later. I was 26, an old man (lol) when a friend of mine gave a cassette which had Bob Brozmans hot resonator guitar swing in it. Finally a way to combine slide and jazz! mwe3: Would you say Hawaiian music is a big influence in the Southpaw Steel n Twang sound? I saw the video you made of the Sol Hoopi cover, which was amazing. And some of the tracks on your Hales Pleasure Railway, especially track 3, Secret Sunset and the CD closing Still have a cool Hawaiian guitar sound. What can you tell us about those tracks and who were your favorite Hawaiian guitarists and Hawaiian music albums? Western swing players like Herb Remington and Leon Mcauliffe. I started digging them, that was big band swing played with a steel! I found a Japan copy of a 1950s Fender Stringmaster guitar which had a double 8-string neck. I had no idea how to tune it but finally ended up using a 6-chord tuning which I still use. Secret Sunset is played with a 1957 Stringmaster which has the aforementioned tuning. I like that tune, it has many key centers which makes it fun to play! 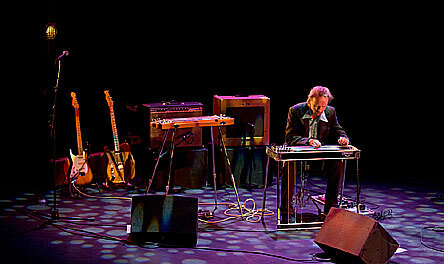 Still is pedal steel stuff, very fragile. I had to be very careful playing those high notes in the tune. 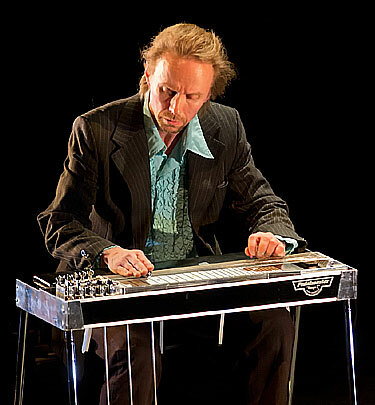 Pedal steel is my newest acquaintance, theres differences and similarities to non-pedal steel, I find both techniques very exciting! At first it was a bit annoying though; almost all the lap steel stuff I had done with my fingers had to be done with pedals and levers when playing a pedal instrument! 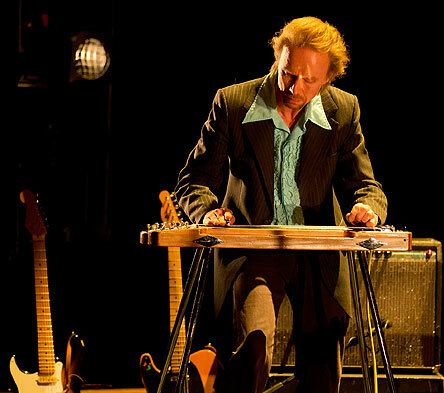 But if you want that pedal steel sound, then thats gotta be learned. 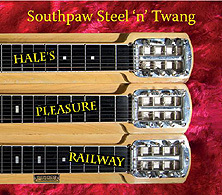 mwe3: What guitars are you featuring on the Hales Pleasure Railway CD? Youre left handed so what challenges if any do you have with guitars, and can you play right handed guitars or do you only play left handed guitars? How about the lefty steel? Didnt Hendrix play a standard right handed guitar upside down? What interests you most in a guitar, sound or looks or playability? And what picks, strings and effects do you prefer? Fender Japan 57 Strat from 1996. During the years Ive bought various lefty guitars since its still pretty hard to, say, borrow one if you suddenly need some certain sound. I can play a little in the Albert King fashion, so that the high strings are up, but my own guitars are mirror images and have low strings up, just like Jimi had them. I guess he played righty Strats because of his personal whammy bar use. A guitar has to be a good player, be it yellow or pink. I happen to have trad colors. Strat and Tele string gauges are 010-046, National Triolian is 016-056 (or 059 if I find em), square neck Duolian needs a little lighter low end. I dont use those old Nationals on the SST record, maybe on the next one. Flatpicks are quite heavy, whatever I happen to have. I play steels with a flatpick and two fingerpicks, no thumbpick. Very unorthodox. mwe3: So thats why you called the band Southpaw Steel n Twang because of youre being left-handed? And how did you come up with the title Hales Pleasure Railway for the CD? 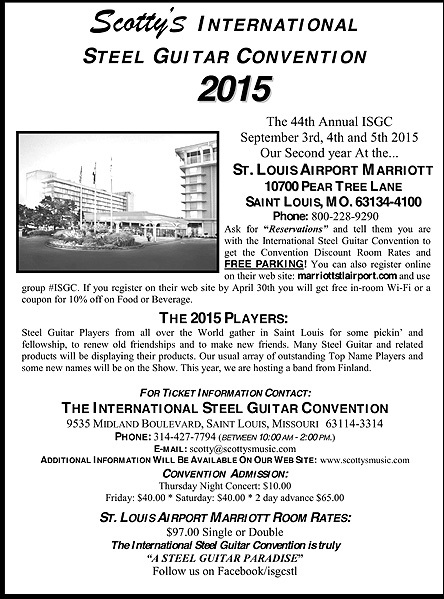 Ville Leppänen: Yep, being a lefty I thought it would be fun to announce that way or another. Hales Tours was a circus act in the early 20th century. They had a railroad car which was wiggled manually to give the customers inside an illusion of a moving train. At the same time a huge, long blanket illustrated with landscapes was rolled around or past the windows. Virtual reality in its time! Since the SST record is jumping from an atmosphere to another I think its a matching name. mwe3: The lead off track on the Southpaw Steel n Twang Hales Pleasure Railway CD, Open Field sets a great mood for the album. What inspired that track and how many guitars are you playing on that track? Did you use a lot of overdubbing on the CD or was it mostly done live in the studio? Ville Leppänen: Open Field is played with two guitars: first a live band take with a Strat, then pedal steel was added. I think the steel gives that track a nice, western movie-like feeling. And its exactly a mood setter like you said, thats just why its the first track. Most takes on the CD are basically live... on some tracks I wanted some dialogue with guitar and steel and so overdubs were done. mwe3: Track 2 Bayou and track 8 The Game are kind of funky sounding. Were you inspired by instrumental funk? Who are your favorite funk guitarists? Ville Leppänen: Well... I like Meters stuff, Funkadelic, that tight James Brown sound... Bayou starts with a Voodoo Chile idea. On that track the Stringmaster is played with a wah, in my mind that sound is a combination of Sacred Steel and Jimi! The steel gets so organic with a wah! The Game started ringing in my ears two years ago in New Orleans while we were recording another album there. mwe3: Track 4, Bad Alley sounds a little like Creedence Clearwater playing instrumental music. What did you set out to create with Bad Alley and what guitars are you playing on that track? Ville Leppänen: Maybe so, now that you mention it. I listened a lot to CCR when I was a teenager. 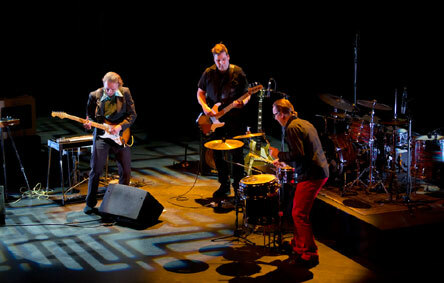 In fact the whole SST band has been working with a guy, my old friend here in Finland who sings and plays CCR hits! That might have affected that song. Its only the Strat there. mwe3: Track 5 Butterscotch has a kind of Les Paul vibe. Were you influenced by Les and his blend of jazz and approach to sonic invention? Les was also very influenced by Hawaiian music. mwe3: Theres one vocal on the CD, track 6 Steel n Twang. Is that the SST theme song in a way and what made you want to include a vocal? Ville Leppänen: Most albums before this... the albums Ive been writing material for, are songs with vocals. I usually sing quite a lot... Steel n Twang is a resting place in the instrumental jungle of the CD, thats how I see it. It gives you time to breathe before you dive again! Ville Leppänen: (lol) I never was a heavy metal fan, I mean, I do appreciate those guys skill but its just not my style or my idea of swinging and rolling things in music. But I like heavy sounds in right place... and yes, maybe this weird track is a bit heavy due to the diminished scale but its also jazzy to my ears. Heavy jazz! mwe3: A definite highlight on the Southpaw Steel n Twang CD is track 10 Feather Wheather. Any story on that track and why did you change the wording in the title? Ville Leppänen: Well... that is just weather misspelled. You know, I havent noticed it to this day! Funny, isnt it... but the track is basically a tune which originates from a Finnish lullaby. Its just jazzed a little with an extended chord progression and the melody is changed so that I dare call it my own composition. Pedal steel, bass, organ, drums. Im glad you like it! mwe3: How is SST being accepted in Finland, are there other bands there doing guitar instrumental music that you recommend? And what plans and musical activities do you have for the rest of 2014 and into 2015? I hope therell be another SST album in the near future. Ville Leppänen: So far so good, weve had some great gigs and the media has been very positive! There are plans trying to fix something in Europe later, but well see... The band is very motivated for this. Hopefully well be able to start the making of another album in the near future. At the end of 2014 Ill be releasing an album of childrens rock music in Finnish, with a band called Takuumiehet. 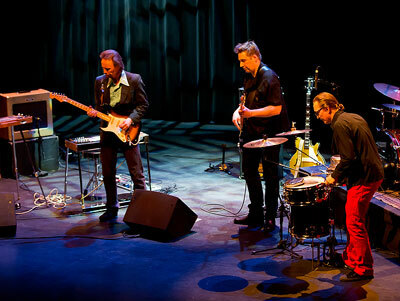 Another band I play and compose in, Micke Bjorklof & Blue Strip, will start recording in October this year. We also have quite many SST gigs booked!